According to Pro Football Focus, 45% of all defensive snaps last year were played in a nickel formation, with an additional 12% in a dime look. This means that linebackers who don't play in subpackages are in danger of missing 50%+ of their team's defensive snaps. Since this dramatic decrease in playing time is a huge blow to a player's value, it becomes critical that we continually track which players are staying on the field on a near every down basis. That said, below is a list of the current three-down (every down) linebackers in the league taken from Footballguys - IDP Forums. This list will change as training camp and preseason games progress. I will do my best to keep it as updated as possible. A special thanks to Jene Bramel as he is the true originator and maintainer of this list and I am just mainly reproducing/updating/slightly altering it here for easier access to my readers. 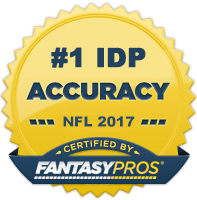 For anyone interested in IDP, head on over the IDP Forum over at Footballguys where there is constantly good IDP chat going on.